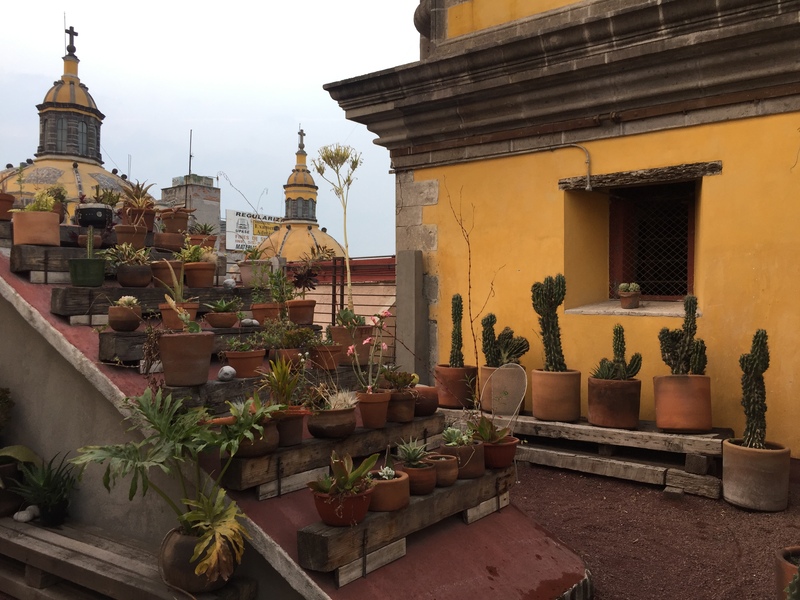 Lindsay and I recently had the privilege of touring Mexico City for 1 month to find the best things to see, the best places to stay, and obviously (knowing us), the best things to eat. Don’t worry, foodie friends, if hotel posts bore you, you can read more about the food in Mexico City here! We didn’t realize just how huge Mexico City was until we arrived. Its population is comparable to New York City’s, and as you can imagine, there is a lot of traffic that comes with so many people inhabiting one place. Depending on where you’re going and the time of day you’re commuting there, it can take one to two hours in the car (and even longer in public transportation). 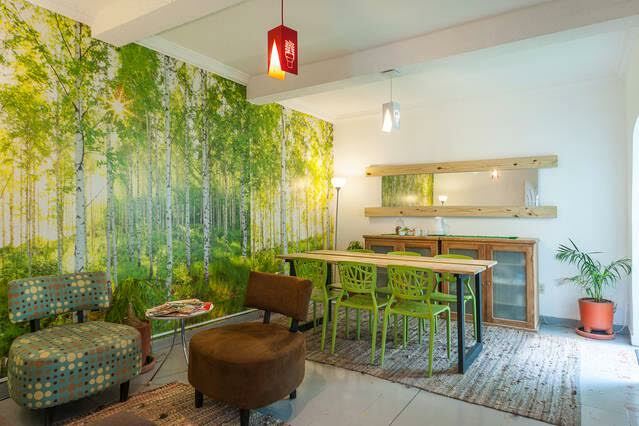 For this reason alone, finding a hotel in the right neighborhood in Mexico City is key. Condesa is a popular and trendy area of the city. This zone is quite walkable and is located near both Parque Mexico and Parque España, which are nice places to sit and people-watch or enjoy a popsicle. The neighborhood was built around Amsterdam Avenue, which was originally a horse-racing track. This proved to be one of our favorite places in the whole city to stroll our mornings away. Art deco buildings, restaurants, cafes, and bars all line the circular avenue, which is now a pedestrian walkway shaded by lush greenery. Neighborhood residents are out walking their well-fed dogs at all hours, and we found everyone to be super friendly and willing to help us find our way if ever we got turned around (every minute of every day, basically). You barely feel like you are in a city when walking around here and bumping into the same locals you saw on the path the day before. We felt right at home in Condesa, minus the fact that we needed a map to get around. The neighborhood is very residential and isn’t overrun with lodging options for foreigners. 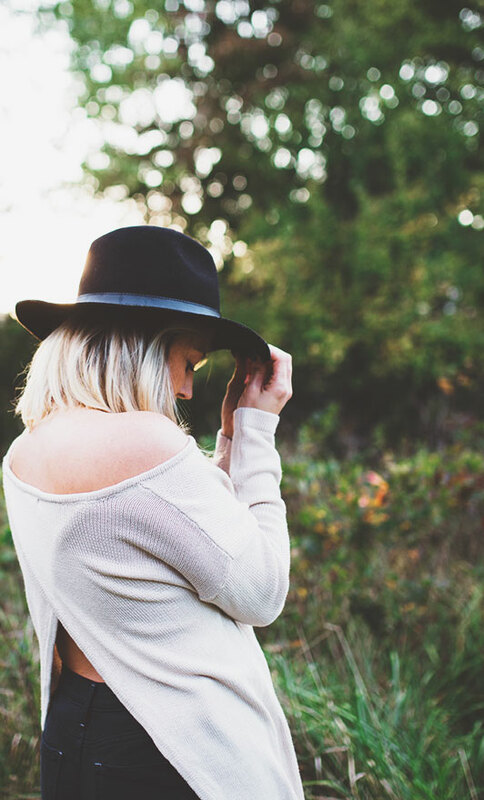 If you’re anything like us in your travel preferences, you’ll appreciate the feeling of just blending in with the locals here. 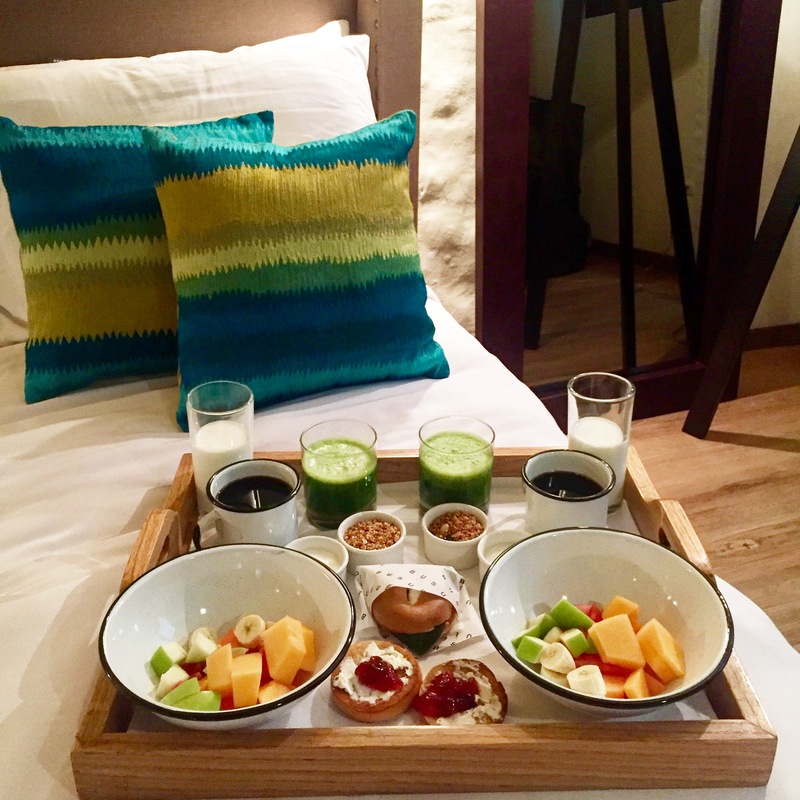 Lindsay and I were guests at Distrito Condesa for seven nights. 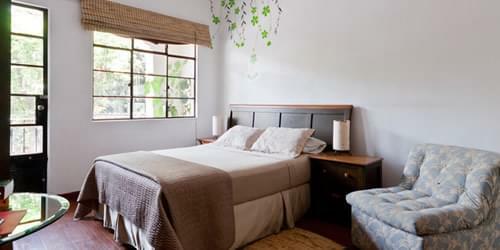 The hotel is the more economical sister hotel to Condesa Haus and is privately owned by Fernando Castillo. Our week staying at the hotel made for a nice amount of time to explore Condesa, and get to know the friendly, knowledgeable and kind staff at both Distrito Condesa and Condesa Haus. Fernando is a Mexico City native, who loves his city and all it has to offer. His sweet and vivacious demeanor made us feel like we’d moved in with our new best friend. The hotel staff – Laura, Axel, Carlos, and Armando – are equally passionate about helping to make your stay everything you’d like it to be. They’re ready with excellent restaurant, cafe, and activity recommendations that will make your stay in Condesa and Mexico City a memorable and magical one. As we mentioned before, the friendly staff at Distrito Condesa make your stay feel as though you are visiting a friend in Mexico City. The property is quite like a home, as well. You can come and go as you please, and we appreciated having keys to the house so we didn’t have to be back at a certain time. It was also great having a water-filling station and a fully-equipped kitchen in case we wanted to prepare ourselves a snack. Not all hotels we’ve stayed at in Mexico City have had drinking water available, which means a lot to us because for environmental reasons, we don’t like buying plastic bottles. At Distrito Condesa, staff was always encouraging us to refill our water bottles as much as we needed. Breakfast is included in your stay and the lovely hotel cooks are happy to make you a Mexican breakfast of choice, like slightly spicy omelettes or cheese quesadillas, and you can enjoy your breakfast al fresco, or inside at the communal table. 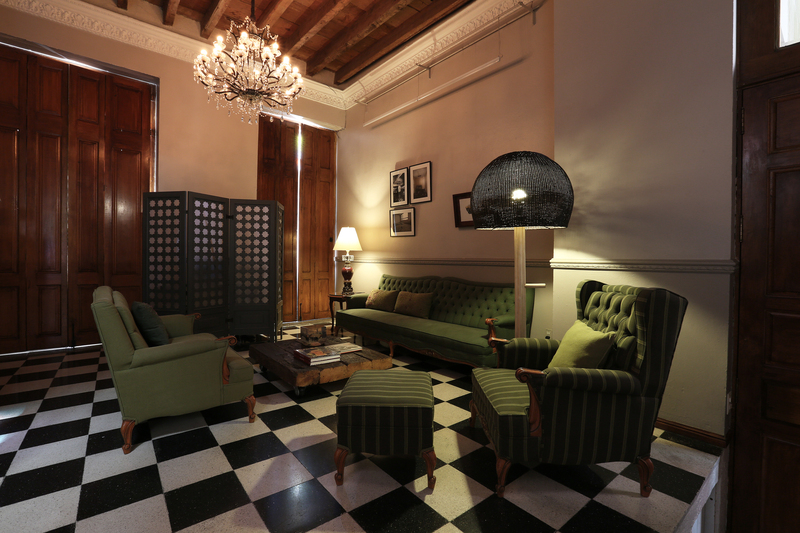 The common area is cozy, comfortable and equipped with sofas, chairs, lamps and reading material. The communal table has a charging strip running through its middle, making it a convenient place to get work done while interacting with other hotel guests and staff. The hotel offers tours with private transportation, which makes it easy and carefree to sightsee around the city. Lindsay and I saw Lucha Libre Wrestling at Arena Mexico. Armando picked us up, bought our tickets for us, and let us know where to go to find our seats inside. He also waited for us in the area in case we wanted to leave early. It was so nice not having to figure out the details of the event ourselves, especially since the arena’s not in the safest part of the city. Fernando has the hook-ups in Mexico City! Lindsay and I got to experience the city’s exclusive, members-only speakeasy, Hanky Panky, all thanks to Fernando making a reservation for us. If you’re lucky enough to experience the bar, you’ll get to surprise those dining in the attached hole-in-the-wall taqueria when you leave the adjoined bar through a beer cooler/secret door. This speakeasy makes cocktails that are respected as some of the best all throughout Mexico. In fact, we headed to Oaxaca after Mexico City, and behind the bar in one of Oaxaca’s best restaurants, we spotted a Hanky Panky cocktail menu. It seems like Hanky Panky is influencing bars all across Mexico, and we felt fortunate to be able to visit! 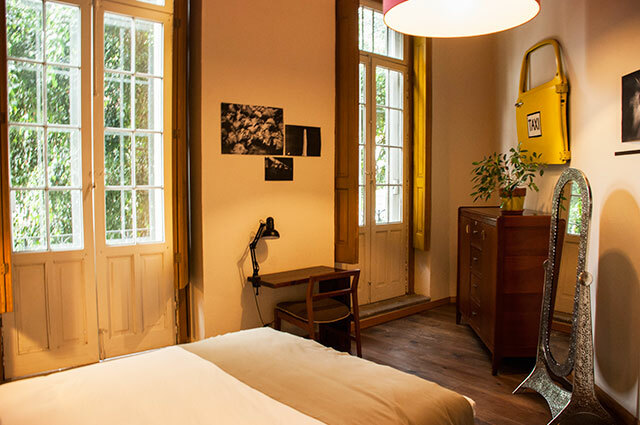 Prices for a room at Distrito Condesa start at under $65. We had the chance to tour Condesa Haus and enjoy one of our breakfasts al fresco at Fernando’s other hotel. 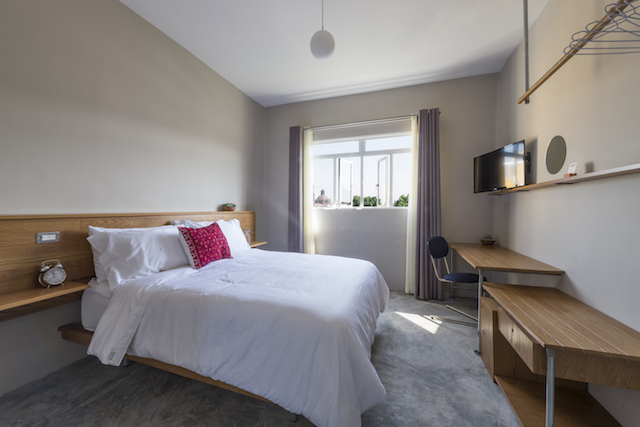 Condesa Haus offers the same hospitality as Distrito Condesa, so depending on your budget and the duration of your stay, you can pick between these two options for your stay in Condesa. 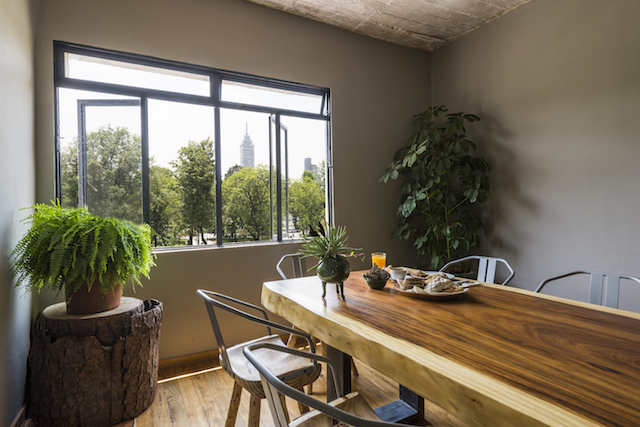 Condesa Haus offers larger suite options, or the hotel’s rooftop penthouse and outdoor garden space, which are perfect for longer stays in Mexico City. If you have a bigger hotel budget, enjoy Condesa Haus’ decor and style, which is more upscale than its sister hotel, Distrito Condesa. Since I miss my Nespresso maker at home, the one at Condesa Haus is the top reason I loved the hotel (I’m a caffeine fiend!). For $2, you can enjoy a perfect espresso anytime of day. 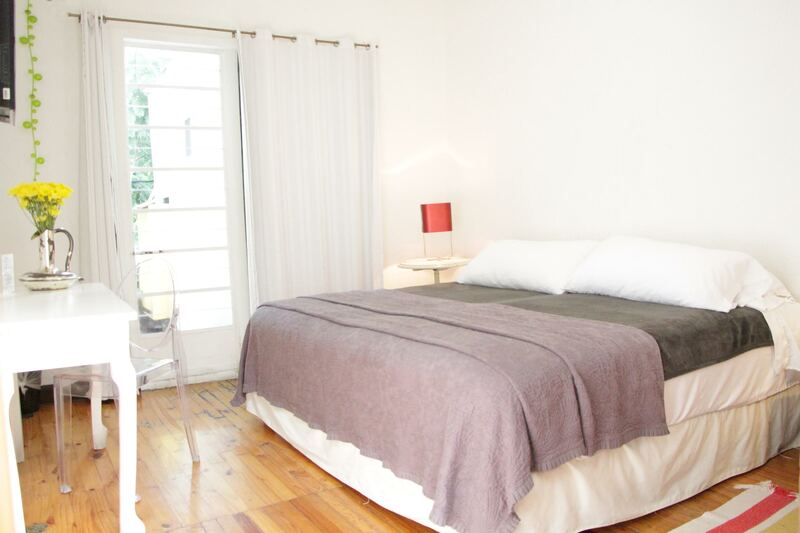 Prices for a room at Condesa Haus start at under $95. 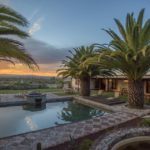 If you’re looking for a spot that isn’t touristy and is tucked away from the hustle and bustle of the city, San Rafael is the perfect resting place for you. This was our first home in Mexico City, and we loved it! We didn’t see another tourist our entire time there (aside from at our hotel’s breakfast one morning). 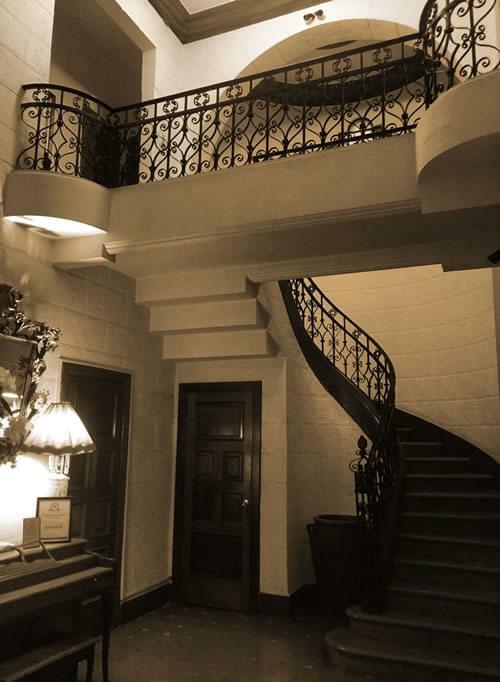 At El Patio 77, you’ll feel like you walked inside a modern art museum housed in a three-story 19th century mansion. Their website really doesn’t do the locale justice, but we’ve been told that they’re updating it, and there was even a photographer there during our stay taking new photos of the place. Believe us when we say that each piece of furniture and art included in the lobby, halls, and rooms is impeccably chosen and placed, so much so that we couldn’t stop looking around at all the treasures, quite awe-struck at all of the incredible artwork that Mexico is churning out. All of the art is for sale, and our bank accounts would have been in trouble had there been more space in our luggage for souvenirs. The hotel’s eight room and suite options represent a microcosm of Mexico and its culture (each room is named after a different part of Mexico, and includes artwork from that region), and the hotel staff reflects the passion and pride for Mexico and its culture back to you for an integrated experience. 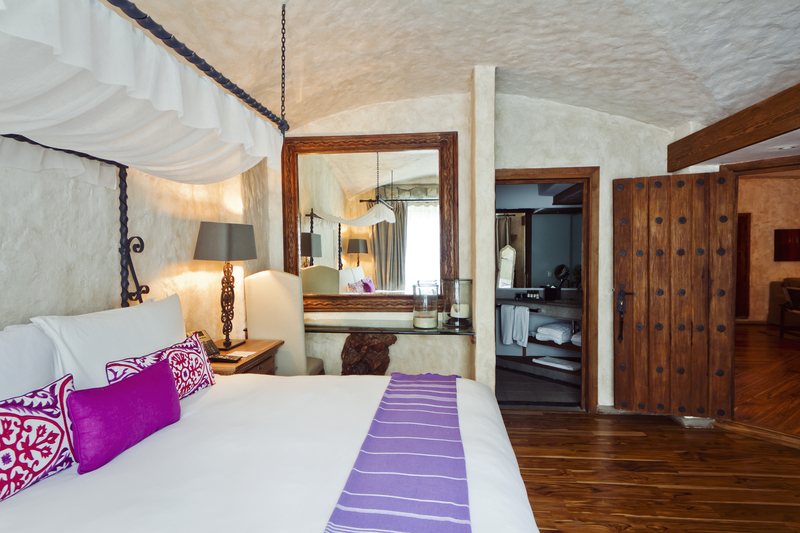 As we mentioned, each room is exquisitely decorated and representative of different areas of Mexico. Lindsay and I stayed in room “DF,” which is conveniently and appropriately representative of Mexico City, the city we were here to explore. It’s a quaint and minimalist room with a double bed and two balconies. It shares a bathroom with one other room, which we didn’t mind at all, as we never ran into anyone else in the bathroom. Check out the taxi door art hanging on the wall! Did we mention the art?!? When we “grow up,” we want the owners of this hotel to decorate our living space. Everything in the hotel is tasteful, practical, beautiful, and not overdone. The hotel is one of the first eco-friendly lodging options in the city. The floor in the covered courtyard where breakfast is served is made from reclaimed wood used at construction sites, and the courtyard is lit with LED lights. El Patio 77 features an innovative system that treats and reuses shower and sink water to flush toilets, and the soap used in the shared bathrooms and kitchen is biodegradable. The shower water is heated by solar water heaters on the roof. There are no TVs in the hotel, so you can save electricity and read a book! The common spaces are intimate and styled with modern touches. The breakfast menu changes daily and the hotel staff offers homemade Mexican-style breakfast like chilaquiles with eggs. And fresh fruit and good coffee. Yum! The hotel staff is friendly and knowledgeable about Mexican culture and traditions, and always willing to help you find what you’re looking for in the city. There is fast Wi-Fi in the rooms. Prices for a room at El Patio start at under $90. 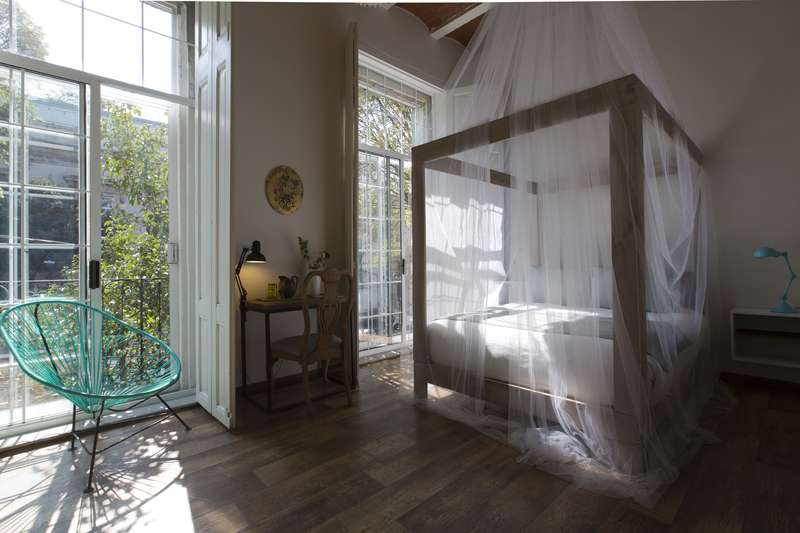 Chaya B&B Boutique Hotel offers a unique and creative concept space in which travelers can rest their heads in Mexico City’s Centro neighborhood. The hotel is a home away from home and offers a relaxing oasis from the hustle and bustle of city life. The hotel is located on the top floor of a building from the early 1900s that had been previously abandoned. The skeletal frame of the building was all that existed when Chaya’s owners decided to revive the building alongside other business owners who opened shops on the lower floors. The building is home to numerous hip and well-curated businesses including restaurants like Butcher & Sons, a Mezcal shop, a yoga studio, a cafe, an ice cream parlor, a tattoo shop, a hair salon, and more. Basically, if you never wanted to leave the hotel building, you wouldn’t have to. And honestly, we struggled to leave based entirely on how comfortable and creative a space Chaya is, though we had two whole months to explore Mexico so staying in a few days wasn’t much of a loss to us. If you do book this place, just keep in mind while planning your itinerary that you’ll probably be inspired to stay in a day or two just to enjoy the hotel. To give you a sense of the layout, Chaya has a large, sunlit breakfast space and two cozy common spaces off of the rooftop terrace. All hotel rooms are located off of this terrace, as well, making it a really nice space to wake in and walk out to breakfast. The terrace is home to a small succulent garden and offers seating (hammocks included!) to enjoy the interior of the hotel al fresco while catching a glimpse of the surrounding buildings. The hotel rooms themselves are minimalist in approach while practical in design. We found them to be uncluttered but impeccably laid out, with exposed wood, plants, ample sunlight coming through the windows, comfortable and plush beds, and quaint touches like candles, old-fashioned alarm clocks, and chocolates and organic soaps made by local businesses. We found this to be a perfect space for both working and resting. Scroll through the below photos and see if you might agree. As mentioned above, Chaya has a charming breakfast room overlooking the city, a studio, a library and TV room, a rooftop terrace, a hammock area and a small back patio with a beautiful plant garden. It’s clear that personalized touches were considered, and that the owners didn’t cut any corners when it came to designing and decorating this space. Location, location, location! 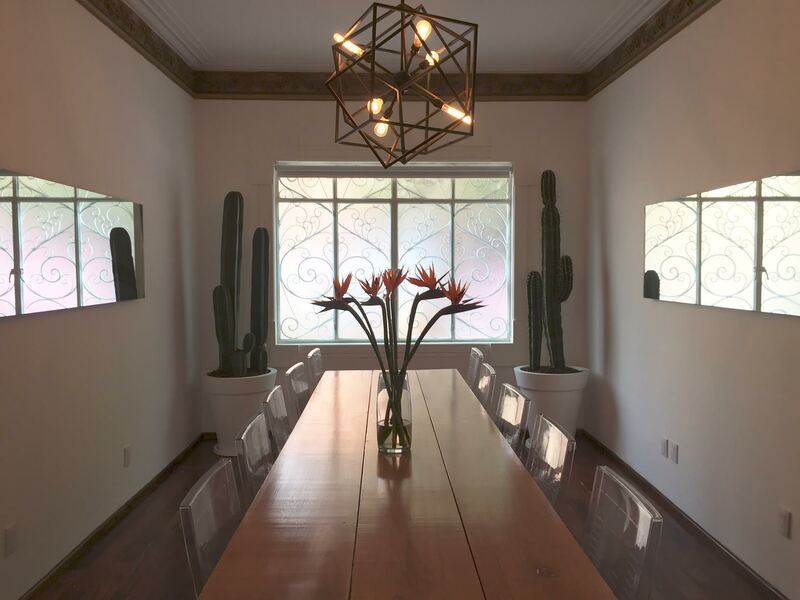 Chaya is located in the heart of Mexico City, right across from Alameda Central Park. You’ll be located within walking distance of numerous historical city sights including Museo Bellas Artes, Catedral Metropolitana, and Monumento a la Revolución. The hotel’s common spaces have the feel of being in someone’s home. The breakfast room and “office” are quaint, cozy spaces perfect for regrouping after touring the city, getting work done or simply enjoying people watching and viewing Alameda Park. Water and warm beverages are available in the breakfast room at all times, so you can relax, unwind, and enjoy the cityscapes on an outdoor hammock, or cozy up with a good book and warm tea in the studio area. The hotel offers a full American and Mexican breakfast including fruit salad, yogurt, granola, and homemade Mexican classics like chilaquiles and quesadillas. You can leave the hotel without having to leave the building to explore local shops, cafes, and restaurants. The restaurants will even deliver to your room, which is how Lindsay and I enjoyed our burgers from Butcher & Sons while staying in Chaya’s Master Suite. The hotel does not have an elevator, so simply ask the hotel staff (who are available at the hotel front desk 24/7) to carry your bags up the stairs. They are more than happy to help. 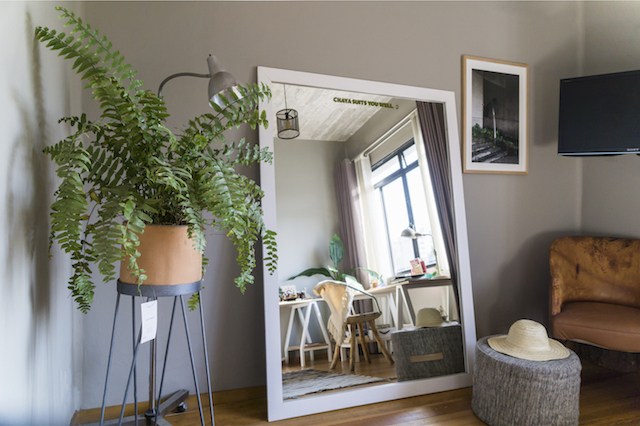 The rooms have a definite Zen quality to them, like how we want all of our own homes to look, before we somehow manage to clutter them with all of the needless junk we buy (or is that just us;). PRO TIP: If you are not used to the hustle and bustle of city living, ask for a room within the interior of the hotel, farther away from the park for a quieter stay. 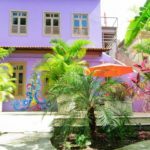 Prices for a room at Chaya B/&B start at $100 USD. Polanco is one of Mexico City’s most affluent neighborhoods, and is a popular spot for tourists. It’s commonly compared to Beverly Hills’ Rodeo Drive and New York City’s Fifth Avenue. Once you arrive, you’ll see why. Personally, we liked Polanco much better than Rodeo Drive and Fifth Avenue, because people were more friendly here, and the neighborhood didn’t seem as pretentious. The streets here are lined with posh restaurants, like Nobu, and trendy stores like Cartier, though, so the experience isn’t exactly Mexican in the traditional sense. However, we still found the neighborhood to be a beautiful (and very safe) one to walk around, with endless restaurant options, a beautiful park in which to stroll, and cultural options nearby. If you’re looking to experience all the amenities of a luxury hotel stay, we highly suggest Polanco’s 11 room boutique hotel, Busue Hotel. 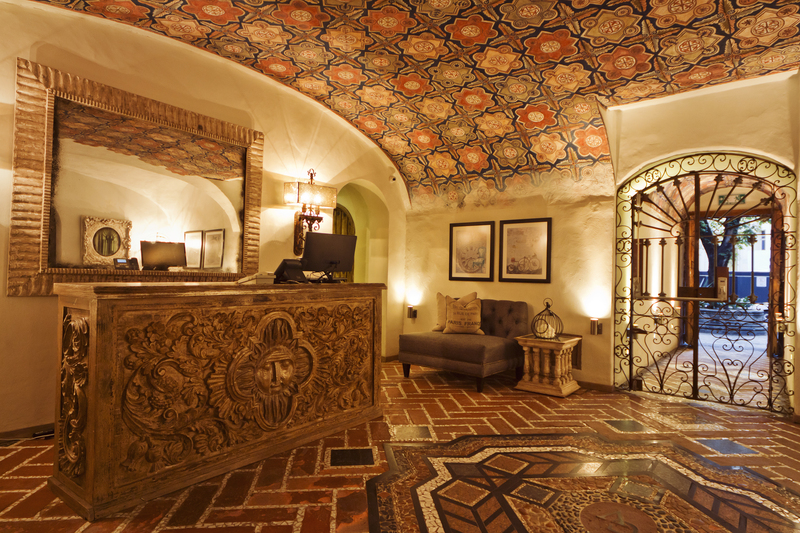 Walk back in time as you enter the hotel’s front door – a four inch thick solid carved-wood piece of art – and make your way through a tiled hacienda-style hallway to the hotel check-in and lobby. You’ll be cordially greeted by the hotel’s staff who are ready to make your stay as comfortable as possible. This was the only place in all of Mexico where we felt like absolute queens. The hotel is close to everything you’ll want to experience in Polanco, but it’s tucked on a side street called Eugenio Sue, which adds to the intimacy, privacy, and luxury you’ll experience during your stay at Busue. An intimate oasis within a huge and bustling city like Mexico City, Busue makes for the perfect place to relax and recharge after exploring the city. Our stay was so accommodating and comfortable that it was almost difficult to leave the hotel to explore its surroundings. The hotel’s tasteful baroque decor exudes luxury, but modern amenities that you’d expect from a luxury hotel are offered, so you get the best of the past and the present! 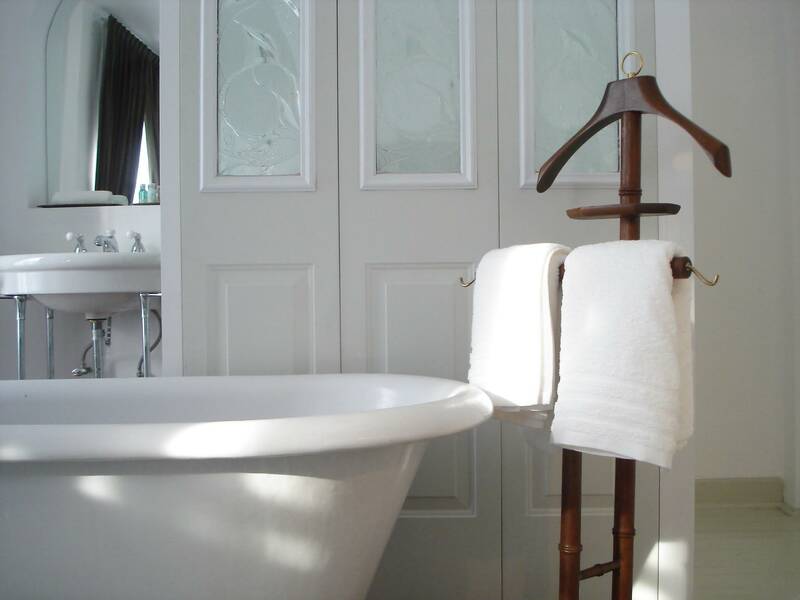 Thoughtful bathroom details that make for a relaxing stay include a stone-floored shower with a wide Spanish-styled shower head, illuminated make-up mirror, L’Occitane bath products (we’re still savoring these! ), plush bathrobes, and branded slippers. Breakfast in bed, to order! Both the breakfast and the beds are worth mentioning. Simply call the front desk to order one thing from each category off the menu, including coffee, juice (orange, grapefruit or green), fruit (alone or with granola and/or yogurt), and a bagel (with cream cheese and jam or spinach, cheese and salami). No need to change out of your bathrobe for breakfast! We really loved the staff at Busue. Jesus, who manages the hotel, is a fun, professional, great-conversationalist of a guy who seemed genuinely interested in helping to shape our stay into something awesome. We lived by his restaurant, cafe, and bar recommendations. Every person who helped us at reception was also memorably friendly and full of helpful suggestions, such as steering us away from neighborhoods that we had no idea weren’t so safe. Prices for a room at Busue start at under $180. Lindsay and I loved Mexico City and would recommend it to anyone! To give you a sense of our adoration, we were only supposed to stay for four days but ended up staying for over two weeks! If you have a long weekend, make your way to Mexico City (we found our ticket from Miami for only $100), and let us know if there’s anything we can do to help you plan your trip!